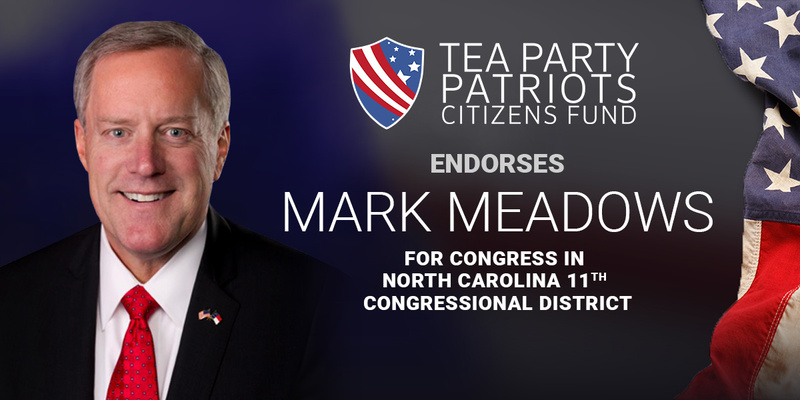 ATLANTA, Ga. – Tea Party Patriots Citizens Fund (TPPCF) Chairman Jenny Beth Martin today released the following statement, announcing that the Super PAC associated with the nation’s largest Tea Party group has endorsed Mark Meadows for Congress in North Carolina’s 11th congressional district. “Conservatives in North Carolina and around the country know a strong conservative when they see one – and when they look at Congressman Mark Meadows, they know they’re looking at the real deal. “Mark Meadows has been a fighter for the values we share across a wide range of issues. He fought for real ObamaCare repeal, for real tax cuts and spending cuts, and for immigration reform that hews to the rule of law. And he’s a strong defender of the Second Amendment. “Mark isn’t just a good Member of Congress, he’s been a strong leader for conservatives. As Chairman of the House Freedom Caucus, he’s wielded his influence over the deliberations of the House Republican Conference to help expand the zone of individual liberty and shrink the zone of government authority. “He’s been a champion for President Trump’s legislative agenda. Not surprisingly, our supporters in his district virtually demanded that we endorse him for reelection.